Today I figured out how my two kids, who were born on different days of the week 3.5 years apart, both have birthdays on a Saturday this year. It wasn’t really important for the good of society, but hey, I was happy to figure it out. As a teacher, I’ve also done my fair share of lesson planning in the shower. Problem is, I forget ideas if I don’t write them down, so in the time it takes me to exit the shower, dry off, and get dressed, I lose the finer points of my brilliant conclusions. Maybe I should invent some kind of waterproof whiteboard for the shower. 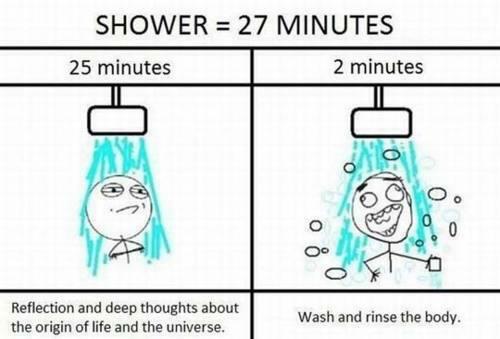 Sometimes I wonder, if I spent more time in the shower, could I solve some large problem to humanity? My most irritating problem on a daily basis is finding a non-crappy pencil for my students to use. Most pencils break on immediate contact with paper. That won’t really help most of the rest of the world though, so I think I’ll just encourage really smart people to take more showers. Maybe we should install showers in places where people research cures for cancer, environmental issues, strategies for world peace, or how to keep a tube of chapstick long enough to finish it. So if you’re a smart individual, go stock up on body wash, and hit the shower! April 16, 2012 in Uncategorized.